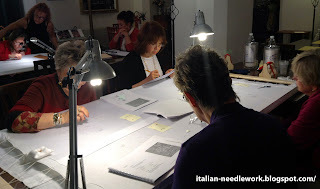 When I was thinking about planning my last trip to Italy which included going on one of Vima deMarchi Micheli's Italia Mia tours, Vima asked me if I'd be interested in taking an embroidery course in Florence at the end of the tour. I said yes without thought to the teacher or the technique, knowing that it would be an experience that I wouldn't want to miss regardless of subject matter. 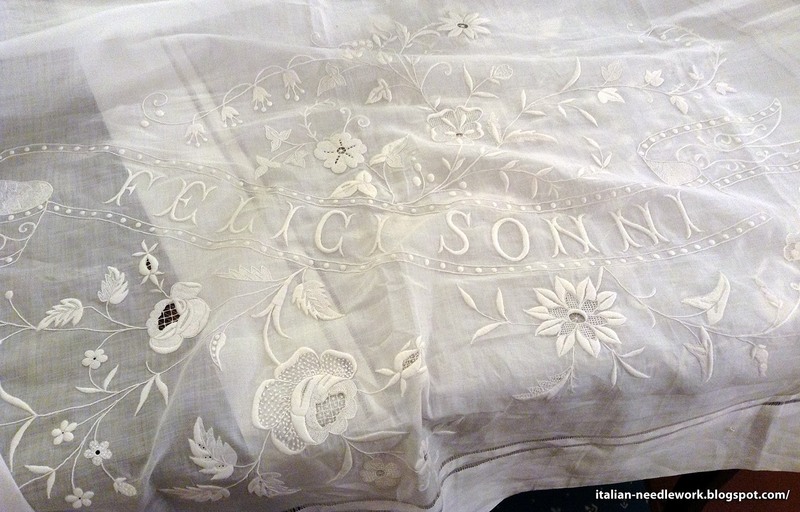 The technique was Florentine Whitework mounted on a frame inspired by a Rovescia which traditionally was the "pretend" fold-back part of the top sheet of the matrimonial bed. This was used to "dress-up" the matrimonial bed for when visitors came to call and was removed before going to sleep. I didn't get a clear photo of the whole piece but you can get an idea of the embroidery from the course booklet cover pictured above (click on the photo for a closer look). Antique Rovescia found in a local flea market. 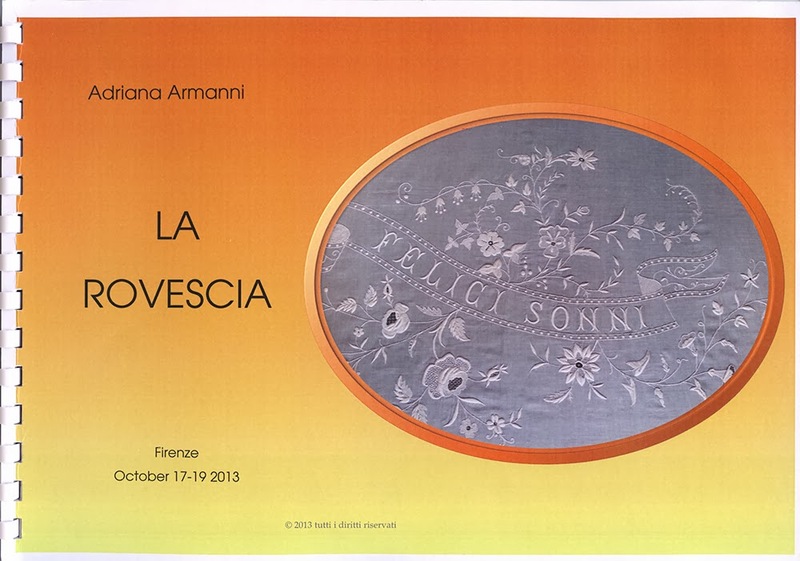 Adriana modelled this course on an antique Rovescia that she found in a local flea market. She also had matching pillow cases which were traditionally part of the set. The work was stunning and so delicate! 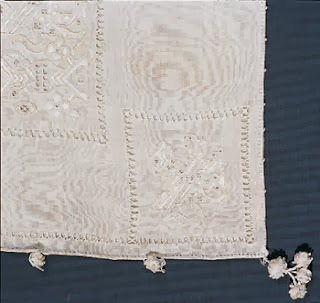 Not willing to burn a thread from her pieces in order to understand what kind of fabric it was, Adriana said that it was either very fine Cambric linen or cotton or very fine Batiste linen and in fact, it was very, very sheer. The sheerness of the fabric is essential to the work as the embroidery is designed to use a combination of stitches to achieve an overall balance of chiaroscuro effect. 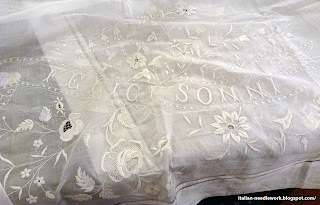 The Rovescia was traditionally embroidered with sayings like this one, Felici Sonni = Sweet Dreams. 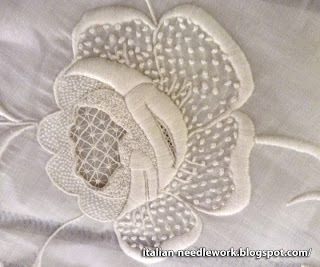 Classic embroidery stitches are used like padded satin stitch, shadow work, French knots, stem stitch, long and short stitch and pulled and/or drawn thread stitches. 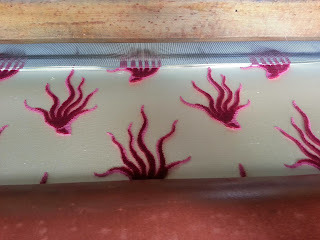 It is important that the fabric be stretched on an embroidery frame in order to achieve an "embossed" effect which would be impossible if the work were done in hand. Good lighting and magnification are essential as the work is very fine. Our own project was not executed with materials as fine as the original but we were still able to achieve the look with the threads and fabrics that Adriana had chosen for us. There was one lady in our course who was not an embroiderer and she was able to produce some lovely results. The huge embroidery frames we worked on. Adriana was able to provide the non-Italian speaking pupils with a booklet in English and provide assistance and instruction in English as well. She not only taught us the practical needlework execution but also the principals and science of the choice of stitches to be used when choosing what to fill the motifs with. This made me immediately think of my blog readers who have asked me where they can take a needlework course taught in English in Italy. 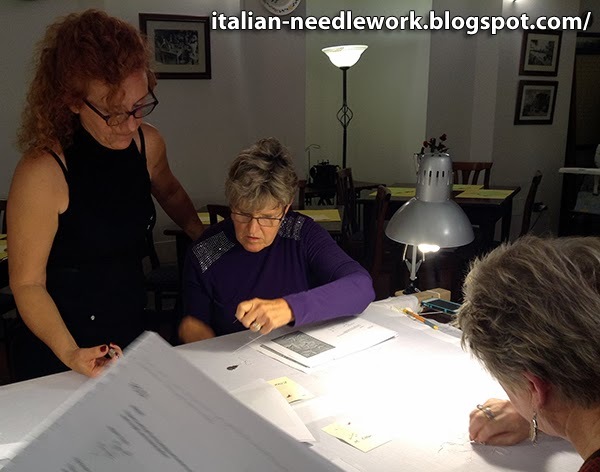 Adriana is well-versed in all kinds of needlework techniques and you could contact her to choose one for yourself on your next trip to Florence. I found her to be a patient and well-explained teacher, she was full of tips and tricks that you only really learn from experience. 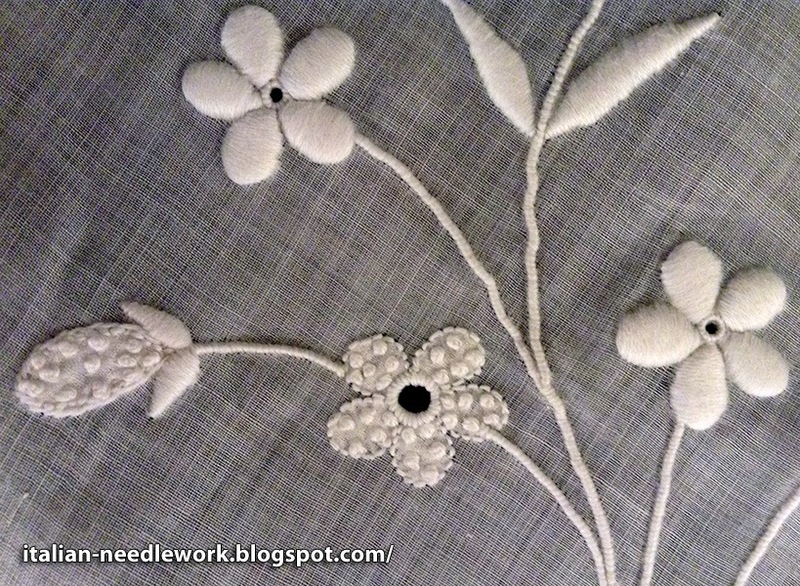 Since she also does commissioned work as well as teaching needlework, you know that she is very good at what she does. When I asked Adriana if she would mind if I wrote a post about our class and published my photos she said that she would be more than happy. She believes that needlework will only be kept alive by sharing knowledge. This is truly an important attitude and one that you don't always find amongst needlework teachers in Italy, many prefer to jealously guard their secrets. At the end of our three days we had covered quite a lot of stitches and Adriana then unmounted and cut up the fabric so that we could each have enough to make a pillowcase of our work completed at home. I spent seven glorious days in Rome the first week of this past October with friends who live on the outskirts of the city. The first day after arriving from the airport, we headed out to celebrate our visit with a gelato. That was it, no big plans, it was late afternoon and I'd been up some 24 hours or more. I swear I only wanted to get the no. 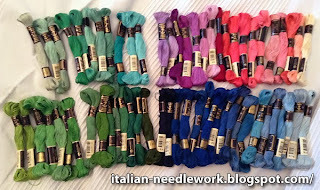 30 coton a broder thread! ... so we had to go back the next day. Luckily I had my iPod with my list of what I already have at home, even though in the end if I'd taken one of everything I would have only ended up with a couple of duplicates. Needless to say, we had a delightful time going through all the drawers filled with threads. This merceria as I said is on the outskirts of Rome but in the case that you might be nearby on one of your travels to Italy, the store is in Via Millesimo no. 53 in the suburb called Torrevecchia. A couple of days later we headed into the centre of Rome to see some newly restored silk and gold embroidered vestments at the Church of St. Francis a Ripa Grande. Along the way from the bus stop in Piazza Venezia to where we took the street car to Trastevere, we walked through the section of town where there are some textile-related stores. 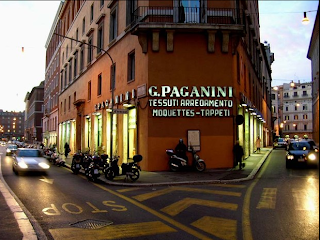 Paganini Fabric Store, Via Botteghe Oscure, no. 50, Rome. We stopped in at the Paganini fabric store which is a huge place with 14 window displays. They have been around since 1948 and carry all kinds of fabrics and rugs. You can see some photos of the inside of the store here. I bought some "cencio della nonna" which is a linen gauze (11 threads per centimetre) for backing Trapunto. You can see it on the back of Silvana Vannini's Trapunto project here. From there we headed to the Merceria Alfis in Largo Ginnasi no. 6 where (among the threads and other textile things) they have a large selection of buttons. Check out my previous post for more shops in Rome. 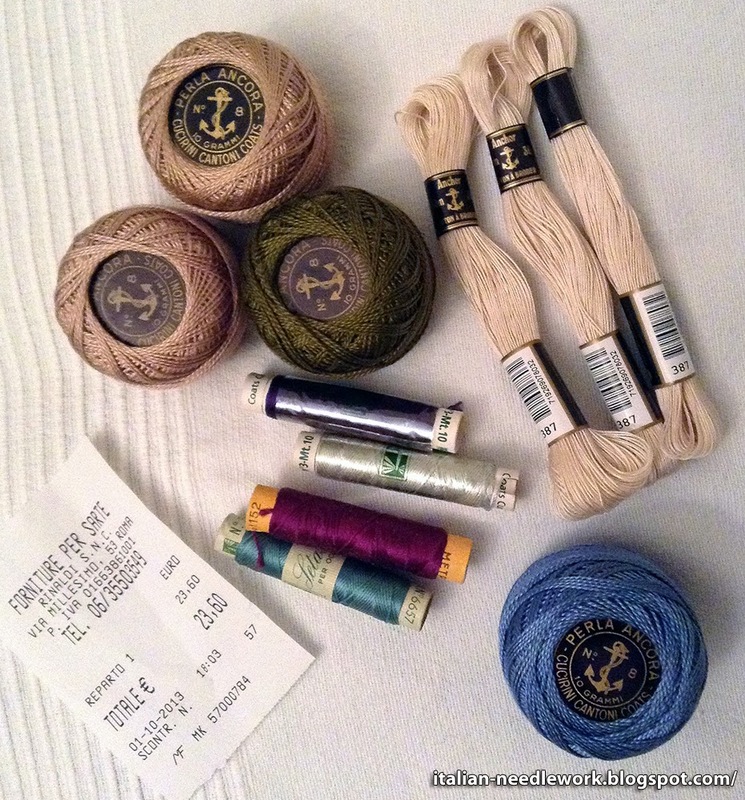 Do you have a favorite textile-related store in Rome? Leave a comment below! Starting on November 23rd (this Saturday!) and running until December 1st there will be a very interesting exhibition at the Casa di Stella Dell'Assassino in Via Cammello no. 15 in Ferrara. Embroidery and the sciences in the hands is a literal translation of the title of this show which will consist of embroidery and lace exhibits, lectures and workshops. The aim of this show is to break down the common stereotypical thinking that embroidery is strictly a woman's activity and, more specifically, that it is only for housewives and homemakers. The events of this show will be all about embroidery: it's anthropological, historical, political and cultural significance across the centuries. Originally this ancient art was exclusively done by men before passing into the hands of women to whom it owes its evolution of styles, techniques, approaches and meanings. Embroidery is intertwined with architecture, painting, sculpture, the human sciences but also geometry, algebra, mathematics, spaces and numbers. These aspects are always neglected and only unconsciously intuitive but they are the basis for embroidery and its perfection. This will be an important exhibition of ancient and contemporary embroidery with alternating technical demonstrations by the participating embroidery schools and a series of lectures in support of knowledge relating to the world of embroidery. 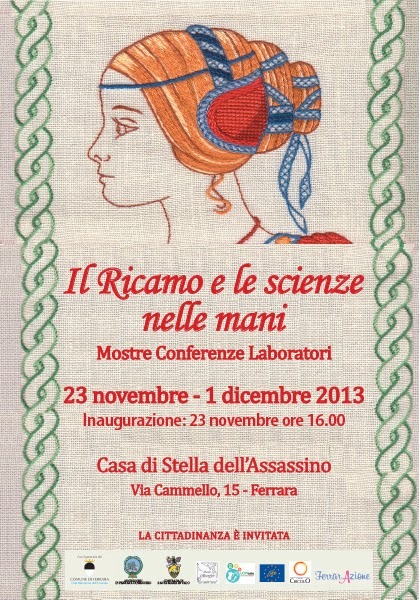 It is an invitation to schools, citizens, experts, scholars and the curious. I think it sounds fascinating! I really wish I could be there. 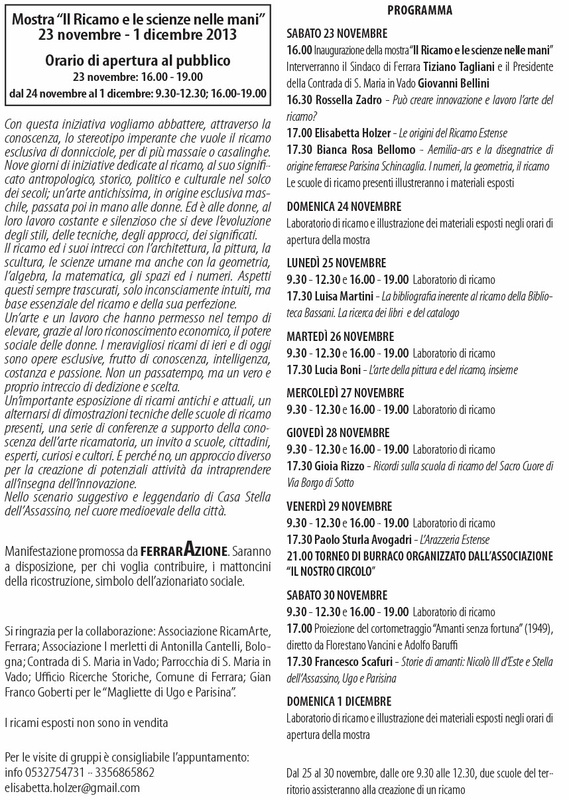 Below is an image of the program schedule in Italian but I'm translating a bit of it just so my English-speaking readers can understand the depth that this show is undertaking. I've never heard of an event like this one. If you go, I'd love to hear from you! - Inauguration of the event. - Lecture: Can the art of embroidery create innovation and work? 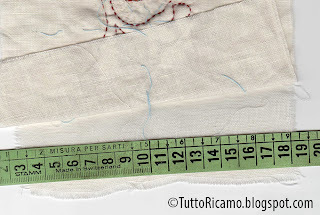 - Lecture: The origins of Estense Embroidery. - Lecture: Aemilia Ars needle lace and the designer with Ferrarese origins: Parisina Schincaglia. The numbers, the geometry, the embroidery. - The participating embroidery schools present the objects exhibited. - Embroidery workshop and presentation of the materials exhibited. - Lecture: The embroidery book bibliography of the Bassani Library. The research for the books and the catalogue. - Lecture: The art of painting and that of embroidery. Together. 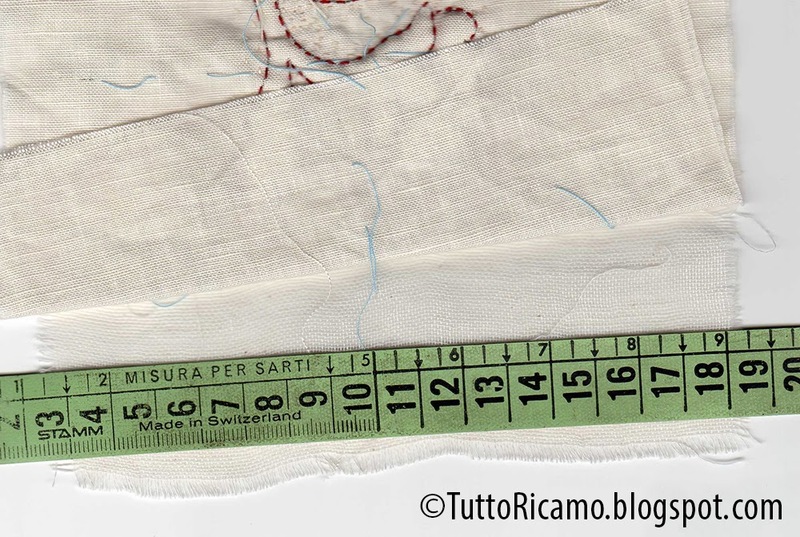 - Lecture: Memories of the embroidery school of Sacro Cuore in Via Borgo di Sotto [Ferrara]. 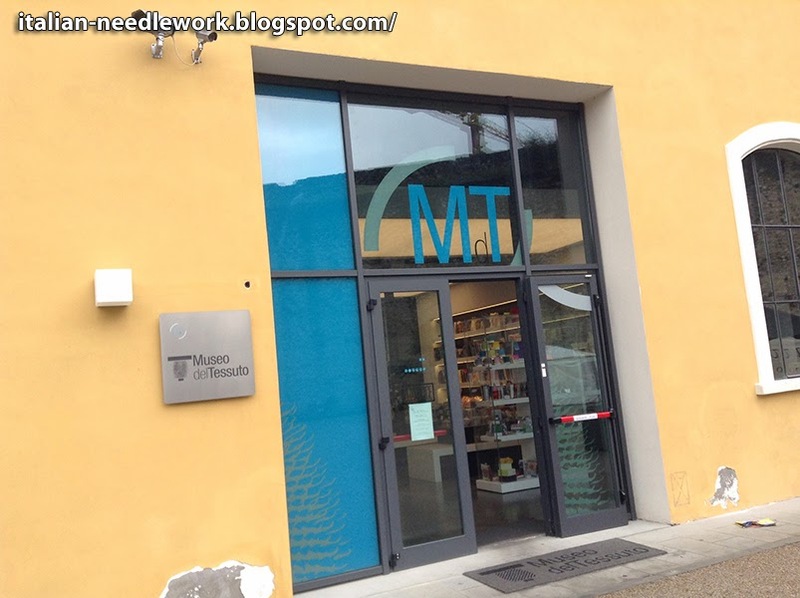 - Lecture: The Estense tapestry weaving mill. - Screening of a short film: "Lovers with no luck"(1949) directed by Florestano Vancini and Adolfo Baruffi. - Lecture: Stories of Lovers: Nicolò III d'Este & Stella Dell'Assassino and Ugo & Parisina. Screen shot from the trailer. I have an update on purchasing the Aemilia Ars needle lace DVDs that I told you about the other day! The publisher Nuova S1 has told me that he can accept PayPal as a method of payment and that the shipping costs are 22,00 euros which is about $30.00 USD. This is for tracked packages. It seems the shipping costs are the same for one or two DVDs. Send an email to order. I'd love to hear from you regarding how it goes and what you think of the DVDs! I always start out thinking that my next trip to Italy will be all long, relaxing days doing research or studying museum collections. I don't know why I think this as the trips always fly by and are full of frenzied trips to see as many people as possible. I always end up not being able to do all the things I wanted to and offending people that I am unable to visit. When I get back home I try to make sense of all the hurried snatches of things I've seen and done and resolve that the next trip will not be so jam-packed. I do however get things done and this trip I got to go to three museums that I've wanted to visit for a long time. One was the Museo di Tessuto in Prato, another was the Museo della Tappezzeria in Bologna and the one I'm going to tell you about today was the Museo del Ricamo in Pistoia. An easy train ride from Florence, you can arrive in Pistoia in about 45 minutes, I'm not sure if you can take a bus in less time, I took the regional train which makes a few stops along the way but Pistoia is only 40 km from Florence. I was lucky to have Maria Elide Melani from the embroidery school Ago Aga e Fantasia waiting to pick me up from the station in her car. I'm sure there is a bus that can take you into the centre of town from the rail station. We did not head directly to the museum from the station as it was too early so I can't tell you how long it takes to get there but Pistoia is a relatively small town. As the Embroidery Museum is run by volunteers, it's wise to double-check that they are open before making the trip. We arrived expecting there to be a lady that Maria Elide knew but instead her husband was taking her shift as she had had to attend to other business. The museum has a large collection of pieces and consequently they are always rotating the items on display. Maria Elide has been there many times but the day we went, she said there were pieces displayed that she had never seen before. This makes repeat visits interesting. The first thing I noticed was that the placards were in English and Italian and that the English was good! Whoever is doing translations for the museum has done an excellent job. While the Embroidery Museum is indeed small (there are only two exhibition rooms), there is a valuable collection housed here and you could spend many days studying the excellently displayed and well-lit pieces. In the second room are two large storage cabinets filled with drawers full of embroidered things. 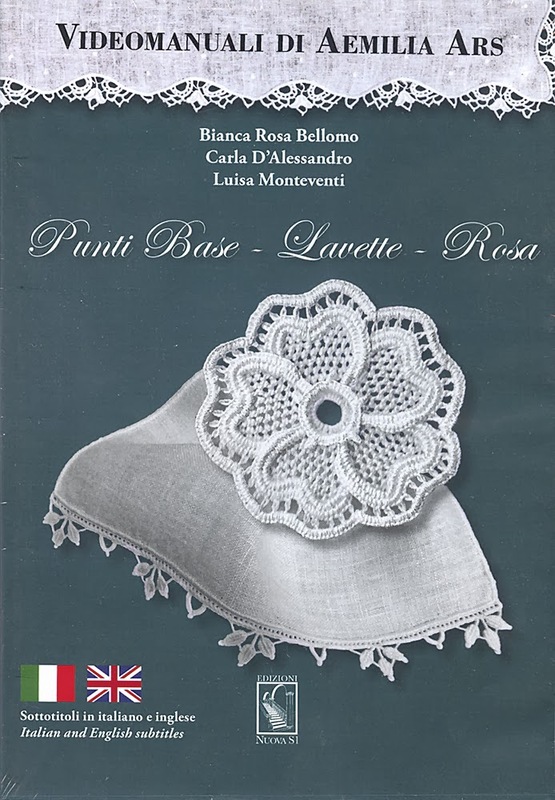 Lots of Punto Antico, Casalguidi and even some Lamporecchio embroideries along with many other Italian and classic needlework techniques are to be found here along with gold and silk embroideries too. The elderly custodian showed us an amazing bedspread embroidered by his mother when she was young. An exciting thing to find out was that the museum offers a research centre, documentation, didactic and historic study. I will definitely be going back! Passing through Pistoia, when you are in the Piazza del Duomo, don't miss visiting the museum, you will be amazed. Even in a few minutes you can see the most important finds. The entrance is free, the personnel are available, cordial and competent. The Rospigliosi Palazzo is the home of the Embroidery Museum, a cave of wonders constructed with knowledge by patient hands. Exhibited here are hand-made articles embroidered in many techniques from the 17th to the 20th century. There are embroidered trousseaux, clothing, tablecloths, doilies and much more. Sacred vestments and antique ecclesiastical clothing of great quality are on display. Periodically the museum gives embroidery courses. 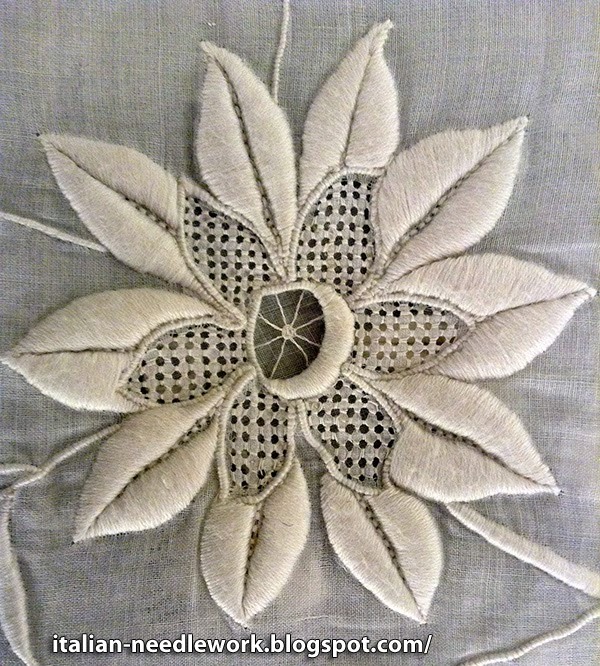 The embroideresses have produced and continue to produce cushions, purses and antique clothing. A 62 segment quilt was made in 2012. 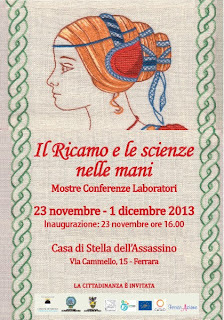 Francesco del Cossa's embroideresses. In the hope that these few hurried images may have stimulated your interest, we await you certain to not disappoint. 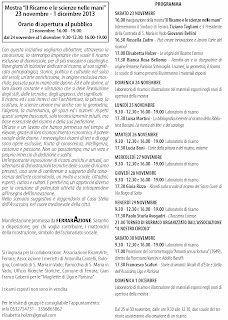 Four days before I left for Italy in September, I received an email from Bianca Rosa Bellomo of the Associazione Culturale "I Merletti di Antonilla Cantelli" in Bologna. 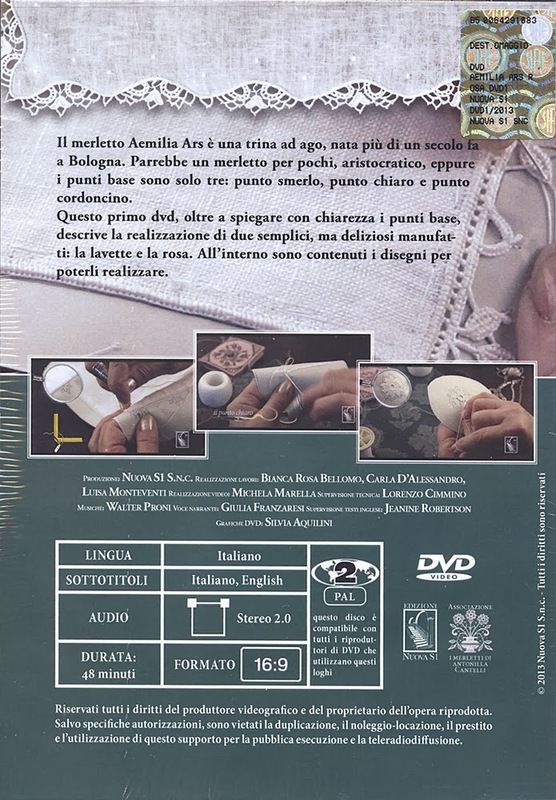 She was putting the finishing touches on a couple of Aemilia Ars needle lace DVD instructional videos that the Associazione had made in collaboration with the Nuova S1 publishing house and there was provision for subtitles in English - could I check over her translations? We worked right up until the day before I left on English subtitles for both DVDs. 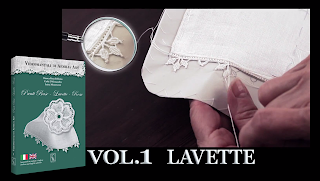 The first one covers the basics of Aemilia Ars needle lace and includes the printed patterns for a lavette cloth with a border and a rose motif (48 minutes long). 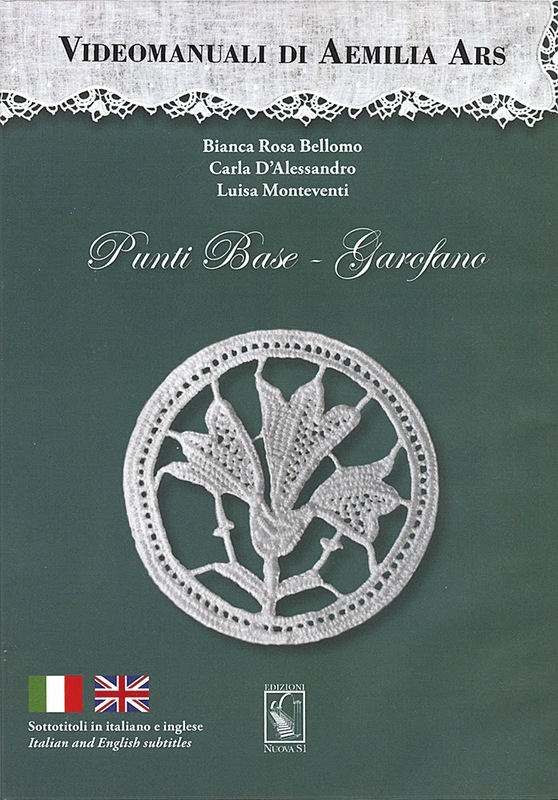 The second covers the same basics of Aemilia Ars needle lace and includes a printed carnation motif design (35 minutes long). 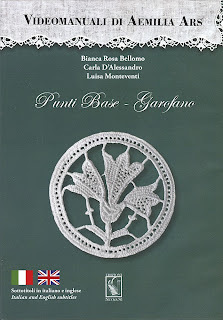 When we met in Bologna a week later Bianca Rosa told me all about how the Associazione's idea came to fruition and the incredible work involved in making the DVDs. She described all the things you never think about like the music selection, typography and the best camera angles. They were hoping to have the DVDs ready for the (then) upcoming handmade creativity exhibition Abilmente in Vicenza the weekend of October 17, 2013. Unfortunately I was unable to get to the exhibition but Bianca Rosa performed acrobatics in order to get me my copies of the DVDs before I left Italy for home. I was going to Ferrara to visit some friends and I emailed Bianca Rosa to tell her that I had to change trains in Bologna and that I would be thinking of her as I passed by her city. She responded that she'd meet me on the platform. Now, the Bologna central rail station has recently undergone massive improvements and it's huge! There are many entrances and exits to the platforms and great confusion can happen. The morning I left Florence for Ferrara there was a freak rainstorm and flash flooding which resulted in many of the local trains being cancelled due to damage along the tracks and huge delays with the trains that were running. Suddenly the half hour I had to change trains in Bologna became 5 minutes. I hit the ground running from my arrival platform in search of my (by now almost deserted) departure platform and upon arrival at the top of the stairs I didn't see Bianca Rosa anywhere. My train rang the bell that it was departing and I had to jump on immediately. When I arrived in Ferrara I contacted Bianca Rosa to apologize for leaving her hanging around the station for an hour wondering what had happened to me and we resigned ourselves to the fact that we would not see each other again before I left Italy at the end of the week. Bianca Rosa however is a very determined lady for which I am profoundly grateful. She called my friend in Ferrara later in the day to say that she'd looked up my return train to Florence on the internet and even though this time I didn't have to change in Bologna, the train would still stop to pick up passengers there. She asked what carriage my seat was in and said she'd be waiting on the platform right where my carriage would stop and that I should jump down for a second and get the package she had for me. My train left Ferrara on schedule and the rain had stopped. Five minutes outside of Bologna I got up and went to the doorway of the carriage to get ready to jump down at the station. All the lights in the train went out and we came to a dead stop. We sat there on the tracks for 20 minutes. Early evening in late October in the countryside of the Emilia-Romagna region of Italy means no lights in the darkness. I had returned my borrowed cell phone and therefore had no way of communicating with Bianca Rosa. I will admit that I thought about Harry Potter and the Dementors while we sat there on the tracks in the darkness. Luckily Bianca Rosa waited and when we finally arrived at the Bologna station, I jumped down, thanked her profusely and jumped back on the train instantly. I was afraid that it would leave right away as we were now behind schedule. I ran back to my seat with my parcel and looked for her out the window but she was gone. The train sat in the station for another 15 minutes. I thought about the little mini-visit that we could have had instead of that last panicked hug. Well, enough about my adventures, you're thinking: tell us about the DVDs! Of course I couldn't watch them until I got home to Canada but I can tell you that they are worth all the acrobatics done to get them! They are priced very reasonably for the amount of instruction there is and if you're like me and have been fumbling around with Aemilia Ars needle lace on your own at home, just watching the execution of the lace and observing the way the piece is held, the usage of the thumb and the movements involved will be a great help to you. Been struggling with those picots? Now you can see exactly how they are done. I really like the graphics and the way they illustrate which parts of the lace you are watching. Even with the sound off and no subtitles, it was very easy to see what was happening. The assembly of the support system is shown as are the various steps to changing threads when you run out in a wide variety of positions (eg. 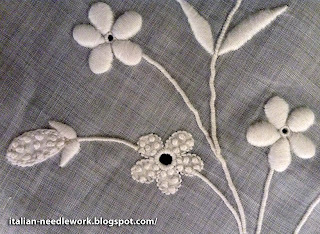 during filling stitches, during structure construction, while executing support stitches, while executing a petal, an arch and other motifs), detaching the lace from the support system, attaching the lace to fabric, attaching the fabric to the support system and many other interesting and valuable tips and tricks. The Aemilia Ars needle lace DVDs are in PAL2 format which means that they won't work on your DVD/TV combination at home in North America but I watched mine without a hitch on my Macintosh computer - I can't tell you if a PC can do the same but I know that there are programs which allow you to view European formatted DVDs, best to inform yourself first if you have any doubts. 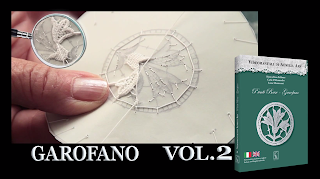 At the moment, the Aemilia Ars needle lace DVDs are only available directly from the publisher Nuova S1. I have talked to them and they are looking into shipping costs to North America and the possibility of accepting PayPal as a form of payment, I will update you when they get back to me. 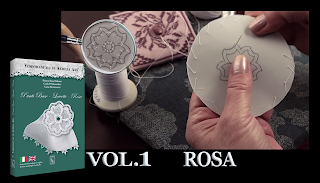 Lacis in California distributes their books but doesn't have the DVDs - you could try contacting them to see if they can bring the Aemilia Ars needle lace DVDs in for you. Please let me know if you are successful, so I can spread the news to others! Ordering update can be found here. I've been back for a whole week after nearly a month in Italy and already the cold and rainy November days here have made the sunny warmth of Puglia, Lazio and Tuscany seem very far away. To chase away the blues, I'll tell you about my trip to Prato in Tuscany and the Prato Textile Museum. Museo del Tessuto, Via Puccetti 3, Prato, Italy. The regional train to Prato from Florence takes 20 minutes and the distance from the Prato Centrale railway station to the Museo di Tessuto is a five minute walk. I've wanted to go there forever and never investigated how easy a trip it really was, no excuses then for not going there every time I'm in Florence! 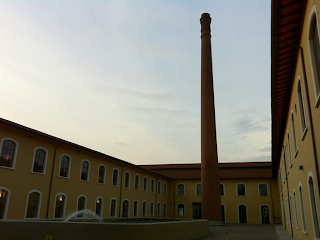 Since May of 2003 the Textile Museum of Prato has been permanently housed in part of the restored rooms of the old Campolmi textile factory. There is a great collection of photos, past and present at the Comune di Prato website. You can read the history of the Campolmi textile company here. The present exhibition at the museum is called Officina Pratese. Tessuti del Rinascimento italiano. [Prato Workshop. 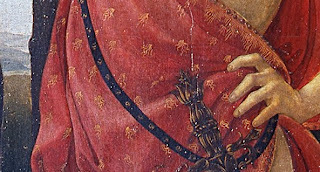 Fabrics from the Italian Renaissance.] In collaboration with the Fondazione Lisio, who reproduced many ancient fabrics and further produced fabrics inspired by renaissance paintings, this exhibit has some truly breathtaking and rich velvets, damasks and lampasses. If you have Facebook, you can see some of them here and here. Pictured above: the voided silk velvet woven by Gianpaoulo Cherchiarini of the Fondazione Lisio inspired by Mercury's clothing in Botticelli's painting Primavera. 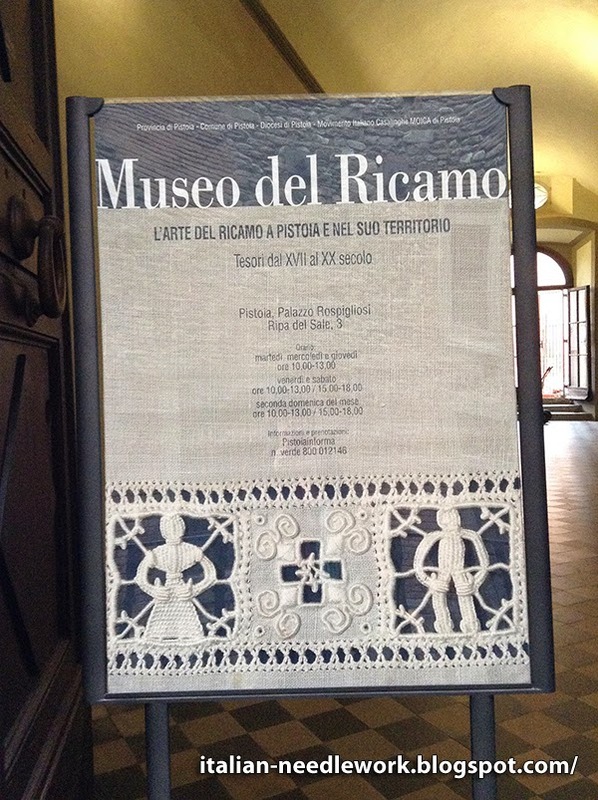 We were exceptionally fortunate to have a fascinating guided visit by the curator Daniela Degl'Innocenti, an extremely knowledgeable young woman who was able to explain the links between Prato textiles and famous renaissance artists, the rich textile history of Prato and it's people, recount the history of the Campolmi textile factory, show us Leonardo Da Vinci's innovations for textile production and so much more. I could have stood and listened to her for hours. The exhibition's collaboration with the Leonardo Museum in Vinci meant understanding Leonardo's designs for increased productivity for many of the steps in making textiles. Check out the models they've made from his specifications here. We were even able to study a few of the lace pieces from a collection that the museum holds but are not yet on display as they are being catalogued - let's save that for another post. The Museo di Tessuto bookshop was a treasure trove of publications that I've seen or read about online but never been able to leaf through and of course I wanted them all! Limited space in my suitcase meant that I was not able to bring home all that I desired but if you're interested in any or all aspects of textile documentation (weaving, spinning, dyeing, fashion, costumes, embroidery, lace and more) you'll definitely find something worthwhile there. I highly recommend taking a guided tour, or if you have more time, they offer collection consultations and educational programs as well. 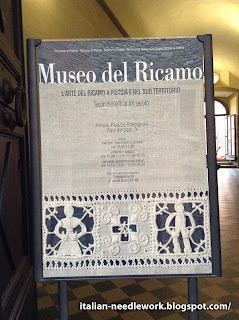 For more information about Prato's textile history, you can read Iris Origo's biography of Prato's famous medieval merchant Francesco di Marco Datini.